It really did feel like that. After a two year wait, the precious was finally in my hands, well, my kindle. And I was terrified that, after all this time, it was going to be shite. It wasn’t. But it wasn’t amazing either. You see, my love for this series was absolute. It was unparalleled. It was a love greater than Romeo and Juliet, greater than Jack and Rose, greater than the love the internet has for beautiful British actors. Any excuse to use this majestic gif, I will take. Sadly, after everything, the final chapter in the Penryn and the End of Days series felt rushed. It had its moments, but ultimately I felt cheated. Especially at the beginning, when it was all Penryn moping after Raffe and him acting all angsty. I expected some of that, sure, but after waiting two years to jump back into a series, I was hoping for a bit more pizzazz. Luckily it didn’t take too long for Penryn to buck up her ideas. “The invasion. My mom. My sister. The massacres. They all come rushing back. He’s right. On the verge of an apocalypse filled with monsters and torture in a nightmare world. And I’m standing here, a moonstruck teenager pining for an enemy soldier. What am I, crazy? Though Penryn’s attitude improved, the majority of the plot did not. 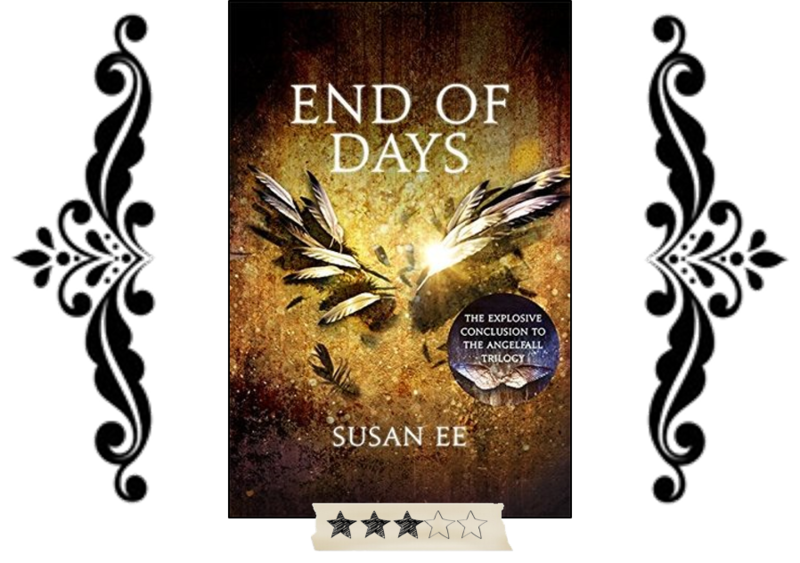 Without entering the realm of spoilers, I’ll say simply that Susan Ee pushed it. This is a post-apocalyptic series, yes with the supernatural element of angels, but that is it. In this book it gets a bit too supernatural for my taste, too magicky, too gimicky. It just felt so off-piste. Sure, the magical elements are important to the story, but pulling a deus ex-machina in the final installment of a series is a cheap trick that I really didn’t appreciate. Really, the only thing I truly enjoyed was the grand finale (minus the slightly abrupt ending). I would have loved more of Paige (who I’ve always loved), more of Penryn’s mum, more of the classic Penryn/Raffe banter! There was a good amount of witty correspondence but darn it, I always want more! I wasn’t sated by this ended. The first two books were of such high standard and this one just fell short. It wasn’t terrible, but it felt half-arsed, cheap and really just a sleep walk. I should have learned from Gollum; what we love the most will only end up hurting us. Okay, perhaps I’m being melodramatic, but this is what severe disappointment does to a person! This book could have been so much better, so much more satisfying. But as it transpired, here at the end of days, it was simply meh.